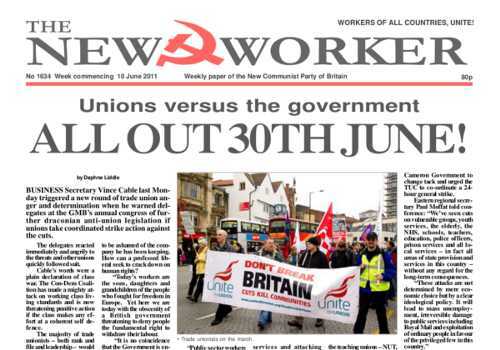 BUSINESS Secretary Vince Cable triggered a new round of trade union anger and determination when he warned delegates at the GMB’s 2011 annual congress of further draconian anti-union legislation if unions take coordinated strike action against the cuts. WAVE AFTER wave of Nato bombers have begun daylight raids on Tripoli in a renewed effort to crack the Gaddafi government and break the deadlock in the Libyan civil war, while loyalist troops launch renewed attacks on the rebel-held city of Misrata in western Libya. BUSINESS Secretary Vince Cable showed what the Liberal Democrats really stand for when he warned the unions that any attempt by organised labour to oppose the Coalition Government’s austerity programme would be met with even harsher anti strike laws.